Printed price is inclusive of a single colour print to one position. There is a screen setup cost of £40 per colour. Minimum order quantity is 500 units. A member of our accounts team will work out your detailed quotation, assessing the production practicalities and then get it back to you shortly. Please correct the highlighted fields and try again. "Show me your lowest price..."
A great way to ensure that your message never sinks. 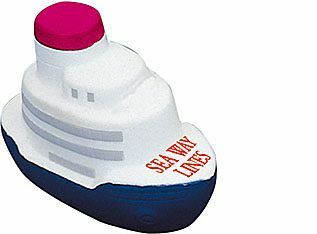 These passenger ship stress relievers are an innovative idea for your next promotion. There are currently no reviews for this item. Be the first to rate and review by clicking below! There are currently no videos for this product, please check back soon!